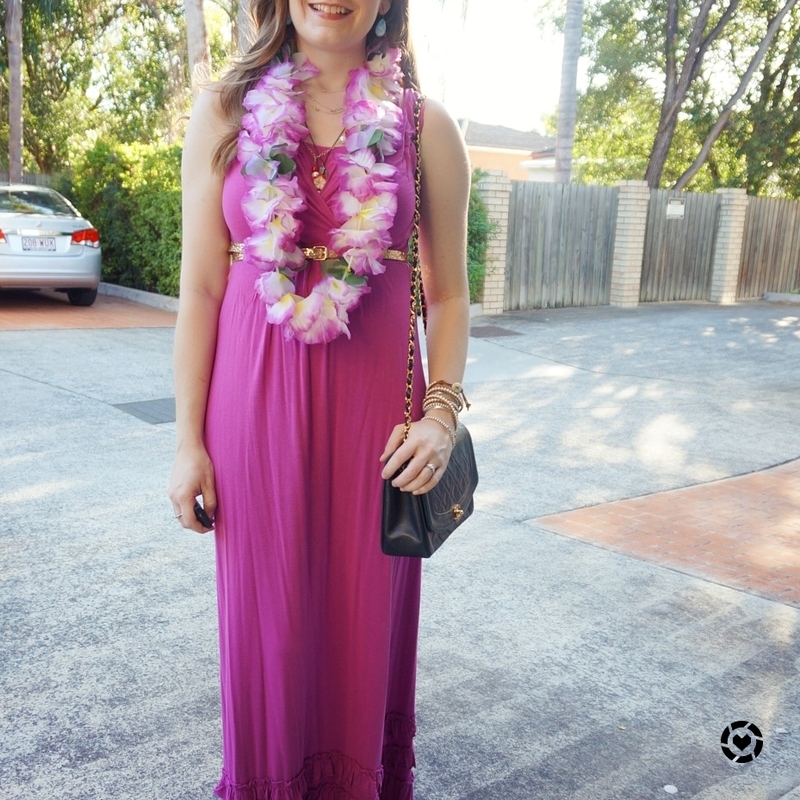 What a beautiful pink maxi dress! Love the bright colour and the addition of lei completes the whole look. Happy Friday Mica, I hope you enjoy the weekend!! Hi Mica! The parties sound very exciting and joyful. I adore both dresses and you accessorized beautifully as always. I pray you have a blessed weekend! That first maxi dress is so gorgeous and the shade looks so lovely on you. I'm sorry to hear that you had to miss the Christmas party that time because of the baby boy hospital stay, but it is nice that you were able to catch up with at least some of your co-workers. Anyhow, that Chanel bag this catch my eye. Such a chic look altogether. I also like the second outfit. A black maxi dress is always a great choice. Cute dresses! I love the pink one on you. It's so crazy that you can actually celebrate Christmas while it's warm outside (crazy for me, that is, haha). I would love to do that one day. Oh hopefully you get to go to one soon! You always have such lovely maxi dresses! I love how some outfits transition so seamlessly from nursing to "regular" wear! Such lovely outfits! I love both of these bags of yours too especially the Chanel. Have a great weekend. These outfits are totally you! Love maxi dresses on you! I love both of these dresses so much! The pink one fits so perfectly and I love the details on the black. I've heard of doing secret santa like that before and I'm not sure I'd like to play, I think I'd get annoyed if I got a gift I like taken off me! Sounds like you had some really fun Christmas parties! Glad you go to go to your work one this year. I just love that Chanel! Im ALWAYS looking for something quick to throw on without sacrificing style. Thanks for the tip! I'm with the other commenters, Mica - that pink maxi dress is FAB on you. You really suit that vibrant pink/magenta. The office party outfit looks so summery and fun! The idea of having a themed party is great, ours is usually pretty stiff. It was fun seeing everyone really get into the theme this year! It's not been done so much in the past. Oh that's so fun that you got to get your little one involved in the gift exchange--sounds like a blast! I love your look (and theme) for your office Christmas party too. I wish we did those! We have a Christmas lunch, but it would be fun to do a real Christmas party too. Oh well. Have a good weekend! Maybe next year you can suggest the party? It is a lot of fun, as was the sneaky Santa game! Maxis are so perfect because they do seem dressier!!! You look amazing in that pink, Mica!! It was such a hot weekend! We spent it in the aircon, haha! beautiful looks, that pink dress is amazing on you, very fresh and feminine. Both maxi dresses are beautiful! Glad you had a great time at your Christmas party! I think there will be time where people reminisce but at least you went this year! 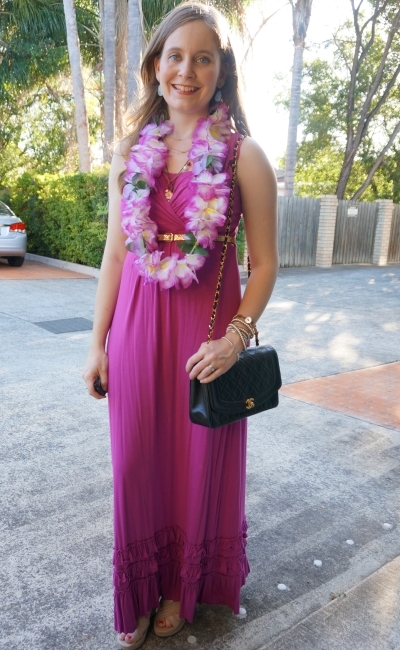 That pink maxi dress is SO drop dead gorgeous on you! I remember breastfeeding my two little ones and clothing was always a challenge when I wanted to dress up! That's also neat you have the Australian Breastfeeding Association there! Oh gosh, I love games like Secret Santa! Sounds fun!! Both outfits look spectacular on you Mica! I love it. Omg!!!! That dress looks AMAZING on you and that bag!!! What a great combo you put together!! At first I thought you were in Hawaii!!! And I got super jealous! I really like the way you matched the bags to all the dresses! So pretty! I love both of the looks. The first outfit is perfect for a tropical vacay. 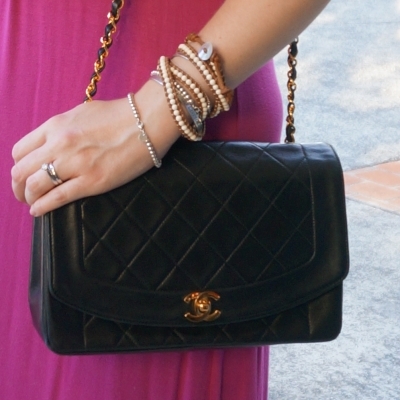 Love this look and that vintage Chanel bag! I love that style because it's harder to get, and not as many people have it as the Classic Flap Bag. You've inspired me to make it my next purchase! Glad I could inspire you! You will love it, such a classic bag! 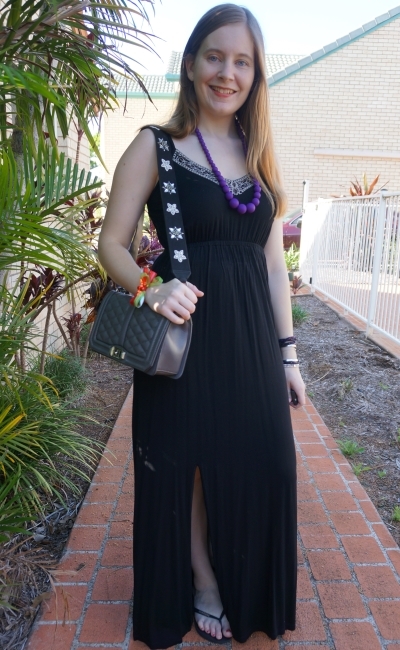 That's a pretty vintage Chanel and your guitar strap is really cool. I've been looking for a strap like this for my Balenciaga 'til I saw one in Coach USA. Your office is really chill with the Christmas party, it sounds fun. Nice to see what you wore on that party. Wishing you a nice week ahead, it was windy here in the weekend. Went to beach today but went home soon because of the fierce wind. Coach have some really nice guitar straps too! :) Sorry teh wind ruined your beach plans! You look stunning in this maxi dress. The colour is beautiful on you and love the details! Dear Mica, it is understandable that it was a pity you couldn't attend the Christmas party from last year and I understand it also that you finally missed your boys absolutely. The Christmas party outfit with the pink dress and the Chanel vintage bag is absolutely fantastic and I'm absolutely convinced you were the most beautiful woman at this party! Also the look you wore for the first Christmas party during the day I like a lot and I see you simply know always how to dress perfectly. Have a happy and hopefully not too hot week. Love the dress you wore to your office Christmas party! Both dresses were beautiful and I loved how you styled them! Being from Minnesota my Christmas party outfits look a little different haha but good inspiration for the summer. Such gorgeous maxi dresses! They look so versatile! You looked beautiful for both events Mica! Both dresses looked great on you. Glad you got to catch up with colleagues. They missed you as well. If nobody had said it before, you totally rock maxi dresses. Its one of your style identifiers. hehe thanks Lorena! I love my maxis! Your sneaky secret santa sounds like so much fun! I need to look into my community for more things like that so I can get to know more moms in the area. I love how many ways you have worn that pink dress! It continues to be such a great piece for you! Thank you all for your kind comments and compliments - I do love my Chanel bag, such a good splurge if you're considering it! That's a great outfit for the party! I love your vintage Chanel bag though, how pretty is that? Very nice! And of course I love the RM too! Great outfits as always, Mica!